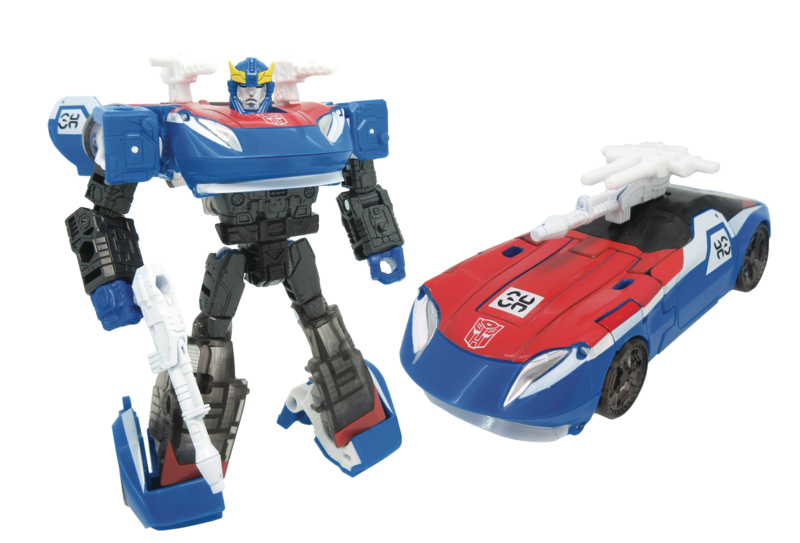 Thanks to Previews World, we have an exciting first look at one of the other two Datsun bros, Smokescreen! With this first image of the latest addition to the Generations Select line, we have a look at both his robot mode and his alternate mode and confirmation that he’ll have his signature shoulder-mounted blasters! From the looks of it, they can peg together to form one double-barreled gun that can also peg into his regular rifle. He’s also sporting his own unique headsculpt and what appears to be the number 38 in Cybertronian numerical signs, which seems to be the first time a Hasbro product has featured Cybertronian numerology. Smokescreen is expected some time in the Fall and will be going for the usual deluxe price of $19.99. Check out the full-size pic after the jump and share your thoughts in the discussion below! Thanks to each of you for the pics and clarification. I'm crossing my fingers for a large cast in the Netflix series. In my ideal world, we also get a Devastation-type console title featuring Siege designs… although since we already had a completely unrelated "WfC" video game, I'm not sure how that would pan out. I know, I pointed that out in my original post. I said combat Megatron has no siege branding besides his instructions which the only difference from his original counter parts instructions is the name printed on them. So the question that I’m asking is that since no where on the outer packaging (unless you open it and look at his instructions) And both so far hasbro’s and Takara’s official solicitations don’t mention them (mainly Smokescreen for Takara) being apart of siege specifically, do we categorize the WFC selects figures as their own line in the trilogy or as a subline to siege like the 35th anniversary figures?